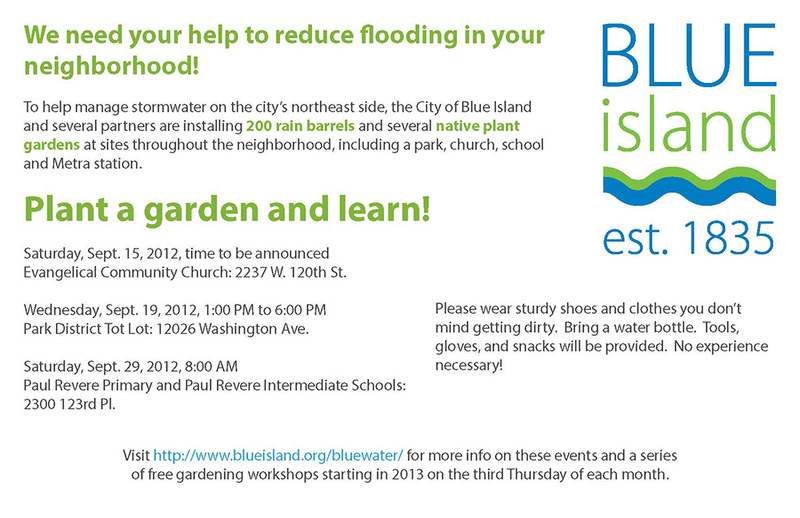 The City of Blue Island is partnering with local organizations and the community to install 200 rain barrels and a number of rain gardens designed to help manage stormwater throughout the area, and they need your help. There are 3 opportunities coming up to volunteer, and all are welcome. No experience is necessary, and you just need to bring a water bottle, some sturdy shoes, some clothes you don’t mind getting dirty, and a desire to help plant beautiful and functional gardens. – Saturday, September 15 at Evangelical Community Church, 2237 W. 120th St.
– Wednesday, Sept. 19, 2012, 1:00 PM to 6:00 PM at Park District Tot Lot, 12026 Washington Ave.
– Saturday, Sept. 29, 2012, 8:00 AM at Paul Revere Primary and Paul Revere Intermediate Schools, 2300 123rd Pl. Volunteers are welcome and encouraged to come to one or more of these events to offer assistance. For more information, visit the Blue Island Blue Water website.